Like Angelina Jolie's continued presence on People’s annual list of the World’s Most Beautiful People, there are certain beauty products that never fail to get named to most-loved lists year after year. 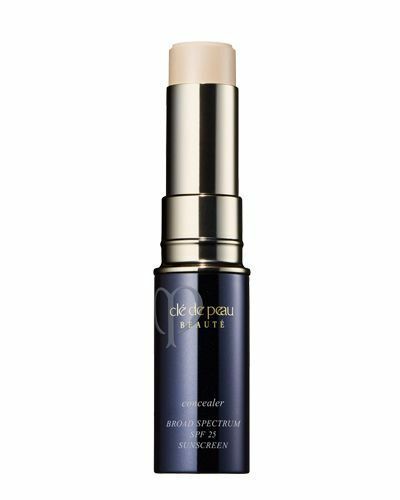 One of these is Clé de Peau’s concealer—a pricey-but-totally-worth-it concealer stick that makeup artists and beauty editors alike swear erases dark circles and covers blemishes with one swipe. The formula possesses the rare ability to be both full-coverage and extremely blendable (for the first few seconds—after that, it won’t budge), so it’s no wonder it quickly reached cult status after its initial launch in the ’90s. Imagine my surprise when a PR representative for the brand casually told me that Clé de Peau will be updating all of its treasured concealers formulas starting immediately with one key change: all Clé de Peau concealers moving forward will contain SPF 25. Keep scrolling to find out more. It’s not the first time a beauty brand has updated a classic formula (see: the time Chanel had to update an ingredient in its beloved No. 5 perfume and the beauty world basically had a full-on spasm), but this one seems especially noteworthy because of the product’s cult following and the fact that adding SPF to a product can sometimes affect its texture and finish. The PR representative promised that users will notice no change in the actual formulation; supposedly, the concealer was sent to many makeup artists who were in panic mode when they heard the news, but they all breathed a sigh of relief after using the updated formula. The SPF addition will just be an extra benefit because devotees often use the concealer under the eyes and on blemishes after spot-treating—areas that could use the added sun protection. I snagged the new version (which comes in a slightly different, fancier-looking case with ridges and a gold bullet on the inside) and immediately spent 30 minutes comparing it to my trusty original. Shade-wise, it seems that the new formula in my shade, Almond, has slightly more yellow undertones. I only came to this conclusion after swatching the entire length of my arm and holding it up to various light sources throughout the office (you know, typical beauty editor behavior). When I used the product on my face, I couldn't tell the difference between the shades. As for its texture, the PR representative was right: The two concealers are virtually impossible to tell apart. In fact, if anything, the newer formula feels slightly more blendable and creamy than the original. One final thought: Makeup artist Sir John once told me that some makeup artists shy away from using moisturizers with titanium dioxide (the main ingredient for physical sunscreens) because it can reflect light, making clients look ashy in flash photography. It looks like the new Clé de Peau concealer only contains 1.6% titanium dioxide, so only time will tell if it will make any difference in photographing. For a non-celebrity who isn’t getting blinded by cameras for red carpet events, however, I can only say positive things about the new update. Did you notice the new Clé de Peau formula update? Tell me your thoughts below, and click here to see more which under-eye concealers makeup artists love the most.